I am happier than I have ever been. Last week I participated in a silent meditation retreat, preparing myself for this Pesach. I spent the week truly getting to know myself, love myself, and accept myself. I spent the week feeling unpleasant and pleasant feelings, and feeling all of those feelings, was the best feeling of all. Passover is a time to rid our personal selves, and our material world of chametz, or what I like to refer to as the “puff factors.” Things in life that do not serve our true selves and purpose other than feeding our egos, and making our perceptions of life into something that is not true. My words may seem a little confusing as I just spent a week in silence, getting to know my personal understanding of true verses untrue, but I can hope that you are able to relate to me on one level or another. Pesach cleaning, or spring cleaning for some is a type of cleaning that allows us to really get rid of things. TO LET GO. To start fresh, with a clean slate. I have dabbled with meditation off and on, (more off than on), for the last few years, but having experienced such intense meditation for a week made me realize the importance of putting time aside for myself, to let my mind rest, and for me to just be. I re-realized the importance of breathing! How silly that might seem, but for me, taking a break from work to take even five deep breaths, used to be really difficult for me. My mind was constantly moving forward, and overwhelmed with thought and concepts of how I could get to my next destination [thus, why I move as often and as quickly as I do, (though in my own defense, I have always known that the pace I was physically moving was with the intent of making it to Israel, with the skills and experiences I needed to make myself confidently, successful here)]. Point being, I am now able to use my breath as my anchor, my point of focus when I am becoming overwhelmed with thoughts of my future, (or when I’m in line at a grocery store in Israel…). One of the meditation practices which I am bringing to my sedar this evening is the practice of labeling. (In meditation, when focusing on certain physical feelings that arise in the body, sometimes it helps to label those feelings, helping to acknowledge them). In our day to day life, we are constantly labeling; labeling people and labeling ourselves. At tonight’s sedar I will help people learn to use labeling in a positive manner. At the end of Shulchan Aroch (dinner), one person will begin by turning to the person on their right and complementing them; telling them something positive about them, or giving them a blessing for their future. Next, the person who just dished out a complement will share with the table one positive thing about themselves. Making that individual focus on their own, inner goodness. My blessing for you all this Pesach, is that you should be able to free yourself from your own labels, to look for the good in others, and to truly embrace the feelings of peach, joy, loving-kindess, and compassion. I will have a second post coming shortly with the dish I am bringing to my sedar. Here is a dish I am bringing to my sedar tonight! Enjoy! Soak chia seeds and dates for 30 minutes being sure to mix ingredients well before letting them sit, so the chia seeds do not clump up. Roast the almonds and brazil nuts, add the cinnamon and mix together. Put the apricots, cranberries, honey and orange zest in a saute pan. Add 1/2 a C of tea and turn the heat onto boil. Bring to a simmer. When the moisture is all absorbed slowly add more tea, little by little to create a jam. 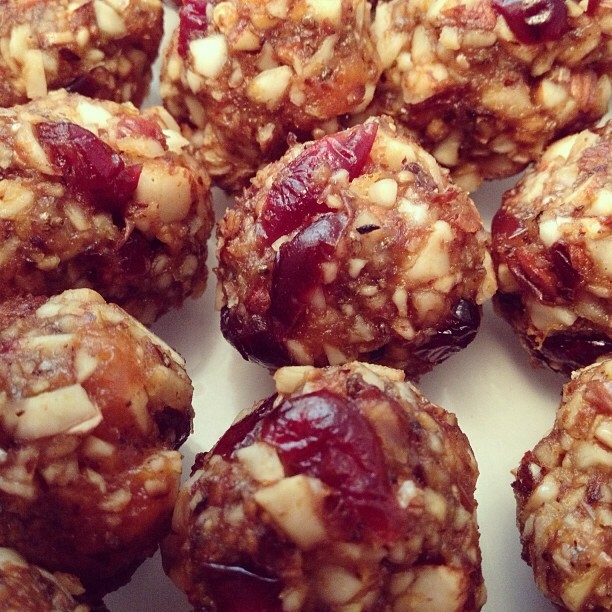 In a mixing bowl combine all ingredients, massage with love, then roll into balls. You’re awesome Julie, awesome! Chag Samaech! Lots of love!